Carcoar Dam is a popular inland sport and recreation destination in Central West NSW, offering year-round attractions for water sports and fishing enthusiasts, nature lovers, campers and picnickers. Free camping is available on the lake foreshores. The main purpose of the dam is to supply irrigation, stock and household needs in the Belubula Valley. The dam features an unusual thin concrete wall that is curved from side to side and also from top to bottom in a double parabolic arch. Walk or drive across the dam wall for panoramic views of the lake and countryside. The concrete wall is 187 metres long and 52 metres high. There are many vantage points around the lake with views of the water and rolling countryside. Open 24 hours a day, all year round. Entry is free. Blayney Visitor information Centre 02 6368 3534. 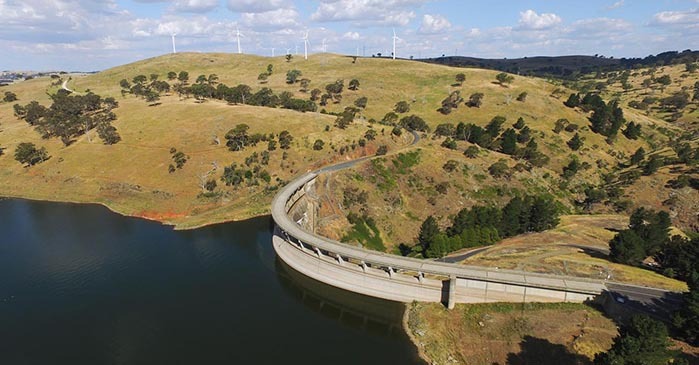 Carcoar Dam is about 55 kilometres south-west of Bathurst and 6 kilometres east of Carcoar in Central West NSW. Carcoar is about 260 kilometres west of Sydney via the Great Western and Mid Western highways. The lake is a popular spot for water sports including skiing, jet skis, sailing and canoeing. The water is very cold and not suitable for swimming. A boat ramp is located about one kilometre north of the dam wall at the Carcoar Dam Sailing Club. The club sails on Sundays during warmer months. Carcoar Dam is stocked with Murray cod, golden perch (yellow belly), silver perch and trout. Redfin is the most common catch. Carcoar Dam is situated on the Belubula River about 6 kilometres upstream of Carcoar in Central West NSW. The dam is about 260 kilometres west of Sydney. The dam has a capacity of 35,800 megalitres, making it one of the smaller NSW water storages. The dam has an unusual double parabolic arch concrete wall. Carcoar Dam is named after nearby Carcoar, the third oldest inland town in NSW. Carcoar Dam was built to provide a reliable supply of water for irrigation in the Belubula Valley and to meet downstream stock and domestic needs. Lucerne is the main crop supported by irrigation. Pastures for sheep and cattle and cereal crops such as wheat are also cultivated. Vegetables are grown along the river. The dam’s small 230 square kilometre catchment is largely farming country in the Belubula River valley south of Blayney. Carcoar Dam features an unusual thin concrete wall that is curved from side to side and also from top to bottom in a double parabolic arch. Massive concrete supports at each end strengthen the thin concrete wall against the weight of the water in the dam. The wall is 187 metres long and 52 metres high. A spillway runs along the entire length of the arch so when the water level rises it simply flows over the top. A road runs above the spillway. Construction began in 1967 and finished in 1970. Trigger - Spillway flows (uncontrolled*) over 1,000 megalitres per day. Trigger - When flow increases above 1000 megalitres per day.